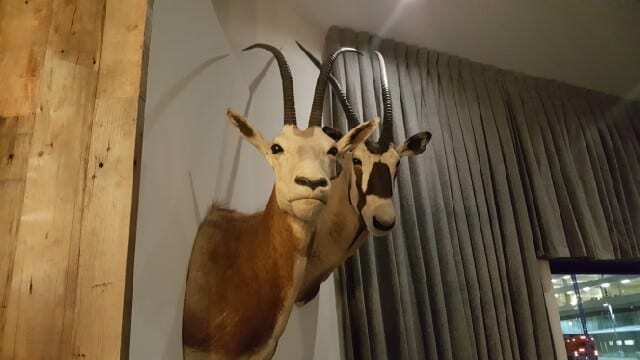 The first thing to greet you when you walk into the restaurant that sits on the corner of 6th Street and Oxford Street (just east of Western) is a pair of African oryx heads that sit just above the host stand. 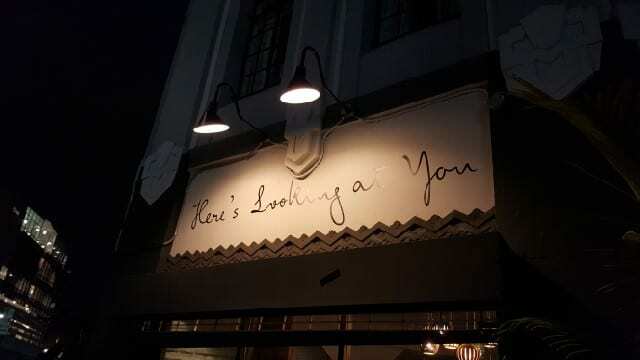 They will be here looking at you! Grab a seat at a table or at the bar and be sure to start with cocktails. 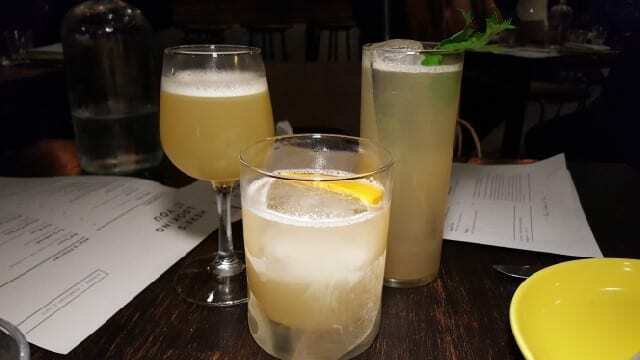 The cocktail menu theme is “Intersections” and explores the melting pot of Los Angeles. The creative and inventive menu was designed by Allan Katz and Danielle Crouch and each drink has an explanation of its origin. We started with a Spa Day (Absolut Elyx, lime, pink peppercorn syrup, Chines celery and Winship Cucumber Bitters) which is a first-world solution for first-world problems, a Genesee Sour (Drumguish Single Malt, fresh green apple juice, honey, lime and Amaro Montenegro) which honors a guy in Wilshire Vista that’s the best host in LA and the tart apples and honey are to usher in a sweet new year, and a Folk Hero (Persimmon leaf-infused Tequila, winter citrus, yuzu, honey and Swiss Violette) which honors Al Renner, a master persimmon cultivator who has worked with the LA Community Garden Council for two years. The menu is sectioned by Vegetables, Seafood and Meat & Poultry. 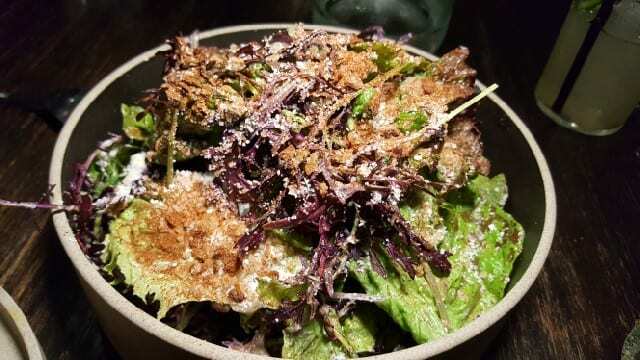 The plates are all share plates and it is recommended to select two or three plates per person. As I was dining with two friends who do not eat meat, we focused on the Vegetable and Seafood sections. 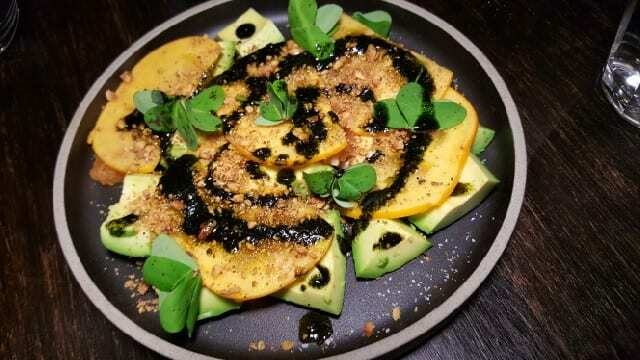 JJ’s Avocado (market citrus, nori, hazelnut, champagne vinegar, persimmon) – A light, simple dish to start the meal, it tastes like something you would eat at a sushi restaurant, but without the fish. 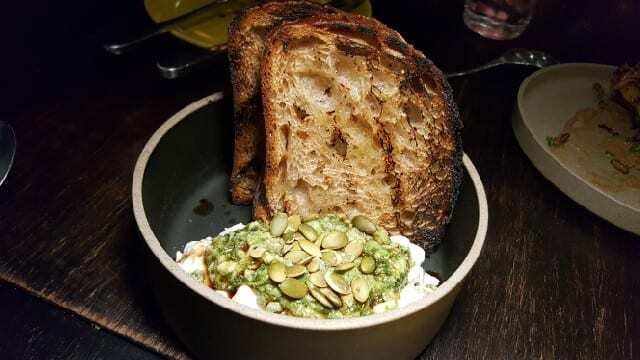 Stracciatella Cheese (pepita, yuzu kosho, perilla, charred bread) – What’s not to like about the creamy mozzarella but the yuzu kosha and toasted pumpkin seeds add some tang, spice and crunch. 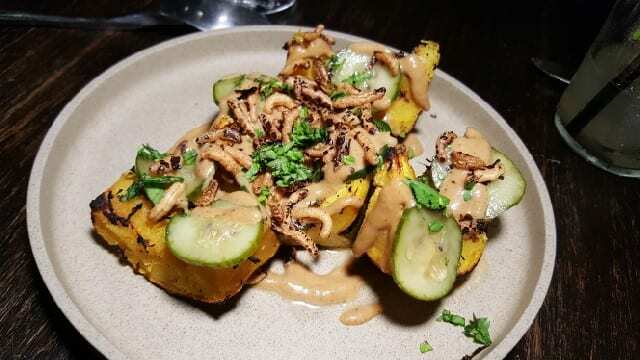 Acorn Squash (goma-dare, cucumber, puffed rice, shungiku) – A truly seasonal dish, the acorn squash is cooked to perfection and topped with sesame sauce and delicate, earthy puffed rice. 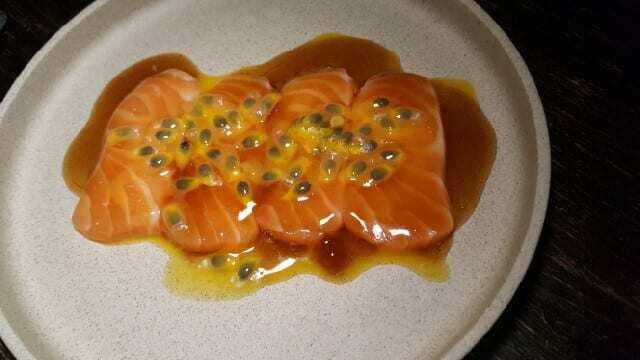 Scottish Salmon (passion fruit, smoked soy, shitake vinegar) – The salmon crudo is sweet which is balanced nicely with the tart passion fruit. 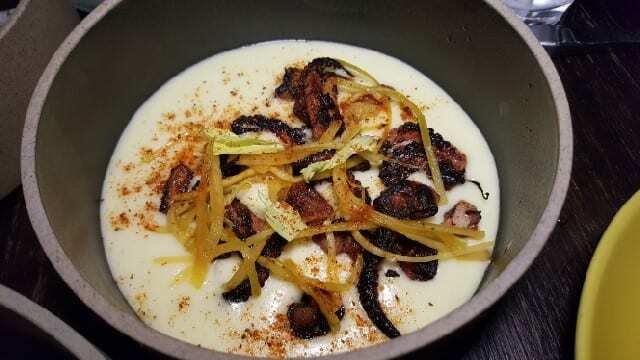 Baby Octopus (la ratte potato, b&b celery, old bay) – Small pieces of tenderly seared octopus rubbed with Old Bay seasoning is set in a bowl of the most decadent and delicious silky creamed potatoes. 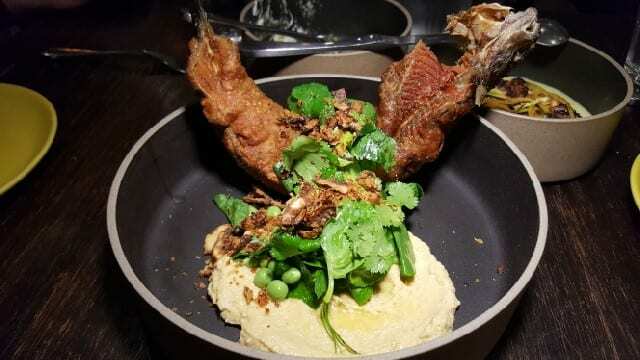 White Trout (khmeli suneli, hummus, snap peas, lemon, cilantro) – The trout is deep fried in tempura batter and is boneless but comes with its head and tail and sits on top of the rich hummus. 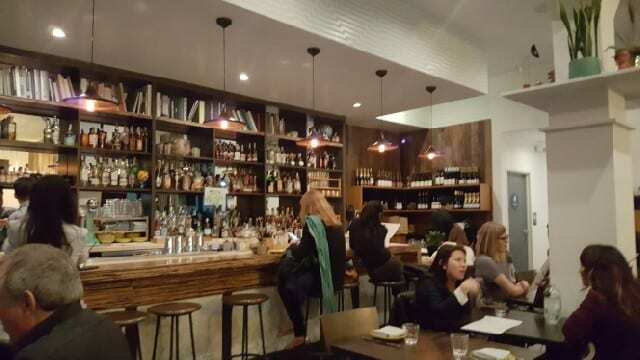 The wine list was created by Danielle Francoise-Fournier, an Advanced-level Sommelier and a professor of wine at UCLA Extension. The list is dynamic, creative and diverse. I love a wine list that offers a unique selection of wines from California, Greece, Germany, France, Austria and Spain. 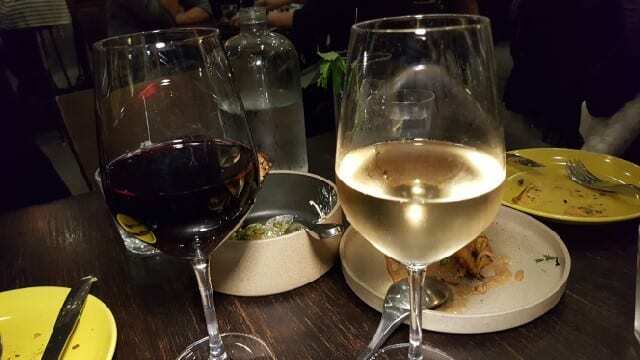 What caught my eye was the Weingut Gutzler Blanc de Noir 2013, a white pinot noir, while my friend enjoyed the Kunin 2015 Syrah from Santa Barbara. 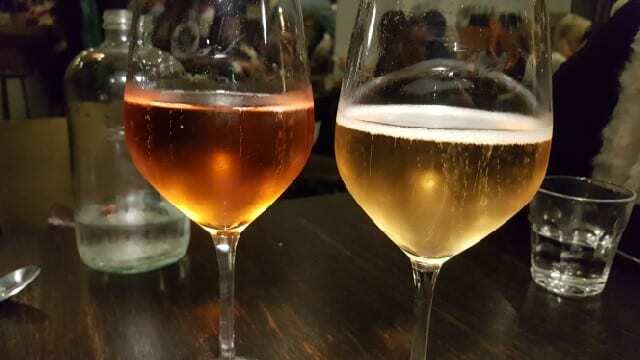 We also enjoyed glasses of sparkling wine, sharing the Val de Mer Brut Nature Rose from Burgundy and the Tissot Cremant du Jura Extra Brut. 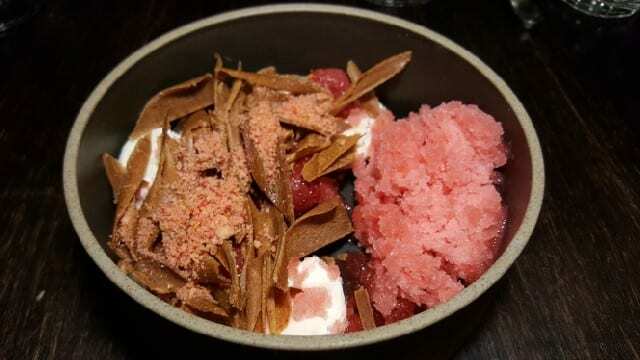 For dessert, we shared the Strawberry with crema, brown sugar, sable and fennel, a light, savory treat to finish off the meal. This entry was posted in Cocktails, Food, Wine and tagged Allan Katz, Chef Jonathan Whitener, Cocktails, Danielle Crouch, Danielle Francoise-Fournier, food, Here's Looking At You, Koreatown, Lien Ta, Wine by Allison Levine.